Oh Peach Pie Day! I took SIX fresh Peach Pies to the office today and we had a nice little afternoon break. 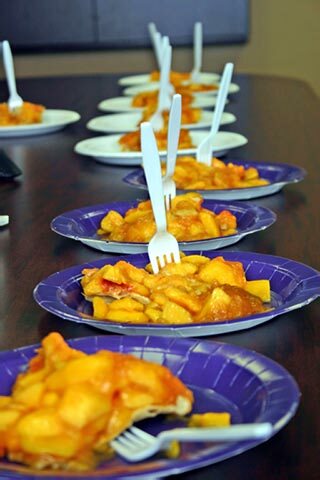 Peach Pie slices on Graduation plates served with Eagle Scout napkins and Wedding forks! There is such a thing as Fed Ex you know. I miss your Peach Pies. Office? You have an office? Oh, very very yummy! I love peaches.